The choreographer, Tania de Paola, and her company, tell his story through dance. On stage, dancers with "enlarged" characters, seem to emerge from a painting by the artist Fernando Botero. Mozart's requiem is re-visited by composer Jerome Baur who offers a new reading. (We recommend that you book your seats for the 2nd, 5th or 10th of March). With Peter Pan, James Barrie has not only written a story for children, but the precursor to the syndrome that bears his name. On the border between fantasy and reality, James Barrie's show will be reborn. He will be confronted with the characters he has created. How will he come to accept them? Who is the true master of the game? "Something appears ... Yes, what is it? At the moment, it is just a hand. The man to whom it belongs remains in the shadows... His single hand is in full light before us... ". The choreographic and theatrical intention of Kyriadie is to dive into the mystical world of death. Not the death that is dark, cold and frightening, but one that intrigues, attracts and intoxicates. One in which we might perceive a small angel or hear haunting music, or that we might want to "imagine". Let us imagine that death is simply a passage to something else, a door to another universe. And let us name this other world Kyriadie. In the journey of exploration of this mystery, the choreography is surrounded by words, by "moving images", by acrobatics on climbing rope, and lively musicians. The path is traced for them by the music of Olivier Courier of the french group AaRON. When he began spending his afternoons in the bathroom, he was never settled; no, he spent pleasant hours there, meditating in the tub, sometimes dressed, sometimes naked. He found himself more serene... contemplating that the most practical tubs were those with parallel edges, with a sloping back and a right cross that allows one to use the footrests. What if we did a show for today? current world. A writing of information, media, bucolic rhymes and crude words. Let us mix the poets of our childhood with little naughty ads. Let us mix posing, appearances with the decay of the body. Let us mix, mix unreservedly, without taboos! And of course, these 7 little writings must always be at one with the seven musical compositions, the choreography and the theater. May the musicians tune their violins! May the dancers adapt their bodies! May the actors play with words in subtle ways where different arts overlap with (im)pertinence and ingenuity. "One never believed so much as when one no longer believes in anything." "You know my love, when changing women, the strongest change is the thickness: our arms can not go around the other in the same way." 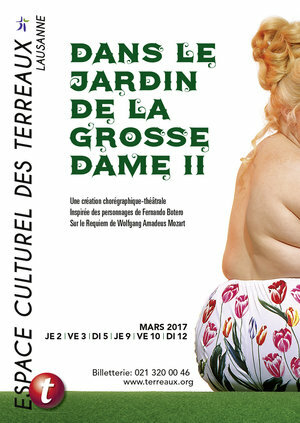 "In the Garden of the Fat Lady" is, in itself, almost a challenge taken up by the young choreographer Tania Paola from Lausanne. To evoke in a completely new way, in a show which follows the progress step by step of Mozart's Requiem, the story, full of mystery, from the composition of this masterpiece, that reflects the anxieties of the composer facing his own end, unknowingly imminent, and that displays, nonetheless, an extraordinary thirst for life.